BALTIMORE, Oct. 2, 2013 -- Diamond Comic Distributors, Inc., the world's largest distributor of English-language comic books, graphic novels and related pop-culture products, announced today that it will partner with Comikaze Entertainment Inc. and Advanstar Communications in a strategic alliance that focuses on expanding the growth of Stan Lee's Comikaze Expo LA's comic and pop culture convention. To be held November 1-3, 2013 at the Los Angeles Convention Center, Stan Lee's Comikaze Expo promises an incredible experience for fans of comics, gaming, horror, sci-fi, fantasy and anime. This year's event will feature an amazing line-up of attractions from vendors and exhibitors, interactive contests, celebrity autograph signings, screenings, renowned panel sessions and gaming tournaments. LOS ANGELES, Sept. 15, 2012 -- COMIKAZE EXPO —– Known the world over for his thrilling and genre-defining comic book characters, Stan Lee and POW! Entertainment, Inc. have partnered with mobile entertainment start-up Moonshark (http://www.moonshark.com) to create Verticus, an all-new action adventure mobile game. A sneak peek trailer of the game (http://bit.ly/R1FWvh) along with other information will be revealed exclusively today at Stan Lee's Comikaze Expo at the Los Angeles Convention Center. The game will be available for download to mobile devices later this fall. Tens of thousands of comic, horror, gaming, sci-fi and pop-culture enthusiasts from all over Southern California will fill up the Los Angeles Convention Center for an up-close look at Los Angeles' largest pop-culture convention owned by comic legend Stan Lee and horror icon Elvira. Fans will enjoy panel discussions, hundreds of vendors, celebrity appearances, interactive zombie obstacle course, Harry Potter-style Quidditch Tournament, movie screenings and more. 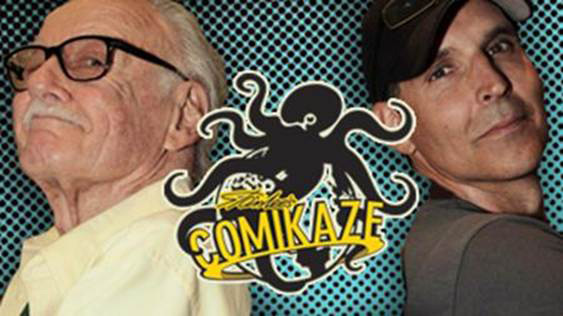 Los Angeles' Only Comic Convention Comikaze to rebrand as Stan Lee's Comikaze presented by Pow! With This Year's Much Anticipated Annual Event in the Fall. Beverly Hills, Calif. (April 12, 2012) – Comikaze Entertainment Inc., the operator behind the largest multimedia pop culture, comic book, horror, anime and gaming convention in Greater Los Angeles, has announced a strategic partnership with world renowned pop culture icon Stan Lee and his company POW! Entertainment. With a staggering 40,000 attendee turnout and over 300 exhibitors during its 2011 debut, this one-of-a-kind-expo was promptly recognized and embraced by attendees, the comic convention industry, and the greater LA area. In fact, LA Weekly named Comikaze Expo the "Best New Convention".